It all started with a beautiful butterfly that my little boy discovered outside our front door. To my non-scientific eye, it was clear it was a very special kind of butterfly thanks to its bright, bold and beautiful colour combination. The sad thing was that it was struggling, fluttering its wings which seemed to stick together, but not able to take off in flight. My boy was intent on saving it and I was anticipating having to deal with a lesson about the circle of life. The more he tried to urge it to climb onto a leaf and gently blew behind it, the more I tried to dissuade him, telling him to let it sort itself out (secretly hoping that it would manage to crawl away out of sight and be left to die in peace, and that he could forget about it). We went out for lunch and when we came back my boy went straight to where he had left the butterfly. Surprisingly, the butterfly had made its way onto the top of an old laundry detergent cap that my son had left for it to try to climb onto and was fluttering its wings more confidently. My boy whispered words of encouragement and went inside to hang up his coat. Not long after, my husband came inside and reported that the butterfly was nowhere to be seen and must’ve flown off. In that moment I experienced an ‘ah-ha’ moment. What seemed like a struggle towards an end, was actually a struggle to begin – to embark on a new journey. The irony that butterflies are often associated with a connection between two states of being, beginnings and endings, did not escape me. So what did I need to begin? What was the message that the universe was putting before me so blatantly? The restless feeling continued and intensified until I started up my computer (which is a MISSION for me in this age of hand-held tablets that don’t need updates and time-consuming software tweaks before you can log on). After managing to deftly skirt the matter of writing on my blog over the past few months, I was suddenly compelled to open it up and hope that my skittish inspiration would come out of hiding. I was drawn to scroll down and then it jumped out at me: Today, 2 November, is the one-year anniversary of my first blog post. I’ve come full circle. How could I not write a post? 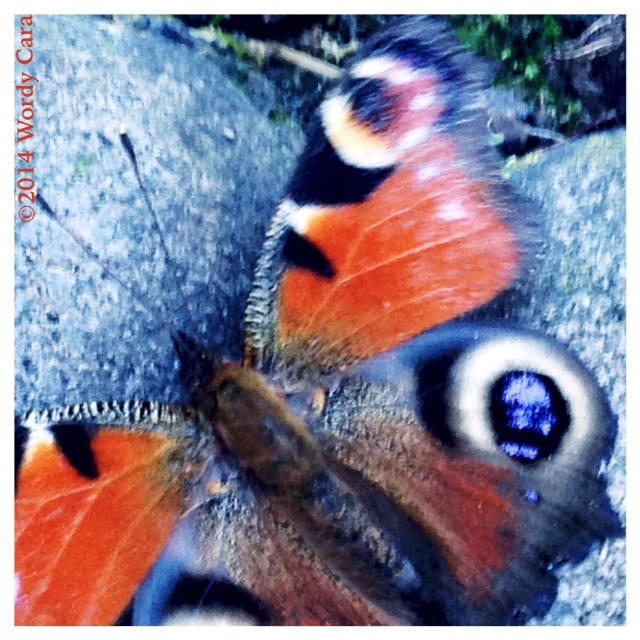 Inspiration presented itself with the beautiful photo my boy took of his ‘rescued’ butterfly. Seasons move on, Inspiration presents herself in ebbs and flows, but what might be considered as an ending could turn out to be a beginning. What my boy and a butterfly taught me today is not to give up even when it appears as though the odds are stacked against you – and to continue trusting that nagging feeling, with or without the sticky fingers!